As I walked through the cafeteria this morning, I heard the buzz from one table to the next. “There is no knowledge without the knowledge of knowledge,” one of the students was telling her friend, quoting Danielle Boutet quoting Edgar Morin. At another table, someone was paraphrasing Danielle’s explanation that the part is as complex as the whole, “So the child in the family is as complex as the whole family. Danielle’s talk last night on “Knowledge that Matters, Makes Sense and Connects: Transdisciplinarity and Complexity in Individualized Studies” seeded itself in many of our conversations, waking up students, faculty and staff to clearer ways of seeing how seeing the world and our own lives. 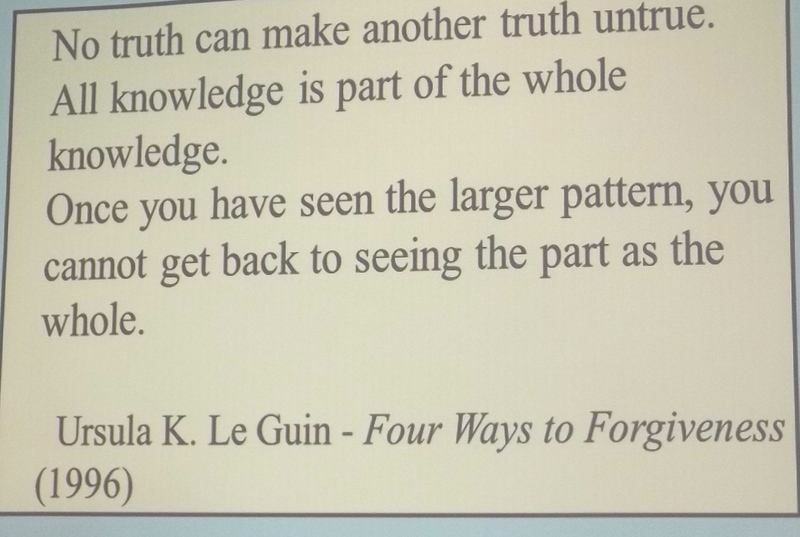 See the part of her talk in whic h she defines transciplinarity here, and another part in which she distinguishes between knowledge that we can receive and knowledge we can discover, recover and reveal to ourselves. See for yourselves what has us buzzing. This entry was posted in Activism, Epistemology (how we know what we know), History & Political Science, Philosophy & Neurophilosophy, Progressive Education and tagged Danielle Boutet, Transdisciplinarity. Bookmark the permalink.